The GoPro brand is synonymous with the action cameras. Whether you use it daily or occasionally, many of you probably have one model or another sitting around the house. Even though GoPro’s point-and-shoot simplicity makes it easy to use, there are plenty of extra tricks you can learn to take your filmmaking to the next level. If your helmet is blocking 90 percent of your GoPro’s field of view, you’ll want to know about it as early as possible, not after you’ve been out kayaking for five hours. If you’re using a GoPro without a built-in LED display, then do a short test run and review it. If you’re using a camera without an integrated screen, then the GoPro apps for Android and iOS can be a huge help, enabling you to preview the field of view and direction of the camera before filming starts. Instructions for connecting phone to camera are available inside the app. GoPros are known for their wide-angle lenses, but a 170-degree field of view (FOV) isn’t the right perspective every time. Some models give you a choice of FOV at certain resolutions, so there’s the option of switching to medium (127 degrees) or narrow (90 degrees) if needed. You don’t need to be an Oscar-winning movie director to understand the basics of FOV and how a narrower setting can give you a more focussed look at the action, almost like zooming in. The FOV option is on the main video settings screen on the GoPro itself, and if you own a new HERO5 Black model then the linear photo mode lets you eliminate the fish-eye distortion completely. GoPros are known primarily for being video cameras, but don’t discount their capabilities as stills cameras either. No matter what model you’re using, you should find a variety of still camera modes capable of impressive shots. Swapping between video and photo modes is a fiddly process, but if you want to extract still images from a video, you can do this right inside the mobile apps for Android and iOS or in Quik on the desktop. Open a media file then tap the Grab Photo icon (far right) to browse frame by frame. The high-end Hero 5, Hero4 and Hero3 cameras have an extra feature built into them called Protune, and if you know what you’re doing with it, it can be a really effective tool. It essentially lets you adjust ISO speeds, white balance, exposure levels and more. It can be activated in the camera settings on the device (under Capture Settings), but by default gives a grainy, washed out look. It’s intended to give professional filmmakers more of a ‘blank slate’ to work with, so research the settings and know how to use them first. You’ll probably only share a fraction of your footage with others, and to help you mark the best bits, there’s a “HiLights” tagging system you can set in the Studio app, the mobile apps, on the smart remote and on the Hero 5, Hero4, Hero 4 Session and Hero+ LCD cameras. If you do the tagging on the cameras or the remotes, the highlights are automatically marked when you import the footage into GoPro’s official desktop app, making it easier to jump to the best parts of your videos and combine everything into a shareable whole. 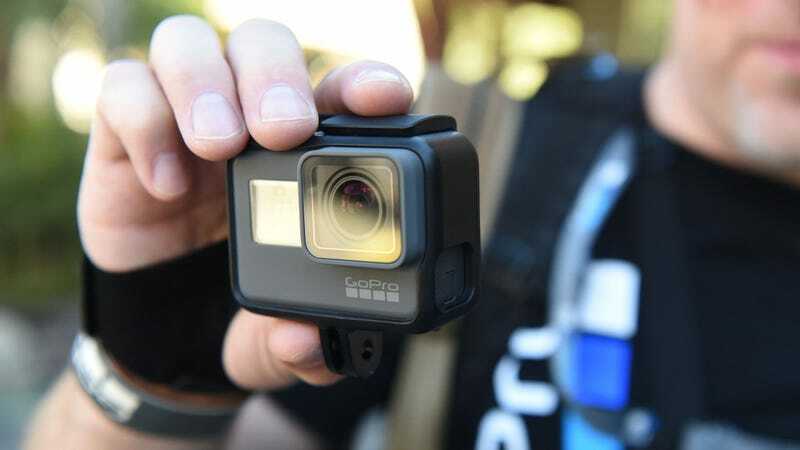 Your GoPro comes with a very capable time lapse mode, which gives you an alternative way of shooting numerous scenes, whether it’s a sports game or a city street. You don’t have to necessarily stick to the “traditional” timelapse subjects (like a slow-motion sunset). Time lapse, available through the on-board settings, is also useful when you want to take individual photos of an event or scene, but don’t want to have to keep manually pressing the shutter button. Set off the time lapse, then pick out your favorite shots afterwards. Your hands are probably not as steady as you think they are, and if you need some extra stabilization help, then simply resting the camera against your chin as you pan around or follow someone can make a big difference to the quality of the video you end up with. For stabilization that’s a little more professional, there are plenty of accessories out there to pick from, from flex clamps to gimbal stabilizers that counteract the GoPros movement instantly while you’re filming. Before buying anything, check out some test footage online. Picked up a brand new Hero5? There’s a built-in video stabilization tool mode to make use of too. The different frame rates on your GoPro’s video settings aren’t just there for show. They can have a real impact on the quality of your finished footage. Use higher frame rates for faster action clips, and lower frame rates (and higher resolutions) in low light situations. If you’re looking to get a slow motion effect afterwards, then you need to bump the frame rate right up to make sure there are enough frames to work with. There’s no one setting that fits every purpose, but 1080p at 120fps is a good starting point for slow motion video. You don’t have to wait until the video editing stage to add a filter, as there are a host of physical filters available too. They can help you get more creative footage and have the potential to make a huge difference in certain scenarios (like macro or underwater shots). Filters are most commonly used by divers to counteract the color of the water, but they can be just as effective above ground too, whether it’s cutting down on excessive reflections from snow or water or making sure all a scene’s colors are clear and saturated. An errant smear or speck of dust can play havoc with your footage, particularly if it’s been trapped between your GoPro and a waterproof case. Take time to make sure your GoPro camera’s lens is clean and free from dirt before the start of every recording session. All you need is a clean, dry cloth to wipe the lens with, and you should avoid using any standard cleaning products (which may cause liquid to get inside the casing). For underwater shots GoPro recommends using your spit or Rain-X to clean the housing.